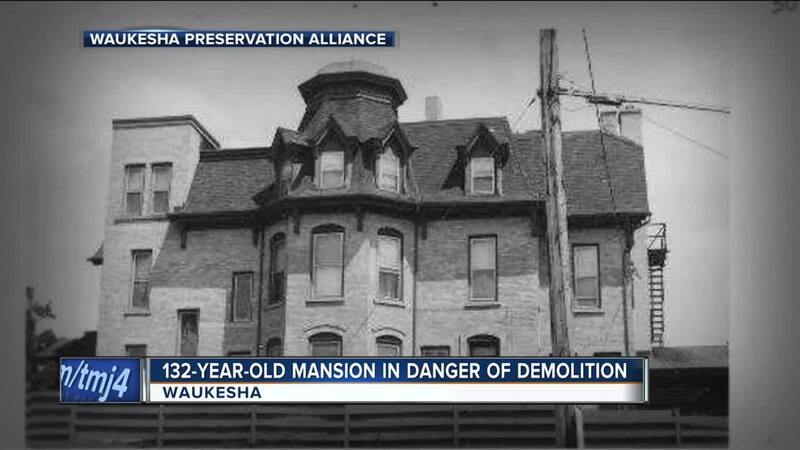 WAUKESHA -- A group wants to stop a 132-year-old mansion from being torn down in Waukesha. Leaders in charge of the building believe misleading information is being spread about why it may soon be demolished. Waukesha Preservation Alliance's Facebook page has been racking up thousands of views, using the hashtag: #SaveSangerHouse. The non-profit group advocates and educates to keep historic landmarks. The post includes pictures of beautiful stained glass and craftsmanship that was built by millionaire Casper Sanger in the late 1800's. "That craftsmanship is equal to what's in the Pabst Mansion," said Mary Emery, President of the Waukesha Preservation Alliance. Ownership has changed hands over the years. It now belongs to Catholic Memorial High School. The high school's board president tells us the Facebook post by Waukesha Preservation Alliance does not show the whole picture. "The condition is not near what it looks like in the photos that are posted," said Mike Grubich, Board Chair of Catholic Memorial High School. "There are holes in the roof, there's structural damage." School leaders claim it would cost hundreds of thousands to bring the mansion back to what it once was, 132 years ago. It has only been used recently as a haunted house each October. They are now working on getting a permit to demolish the building. Asbestos removal has already begun. Waukesha Preservation Alliance President tells us they have a meeting planned with school leaders Monday to talk about the building's future.